Are you thinking to promote your business? Do you want to send personalized/business sms to your family members, employees, friends etc? 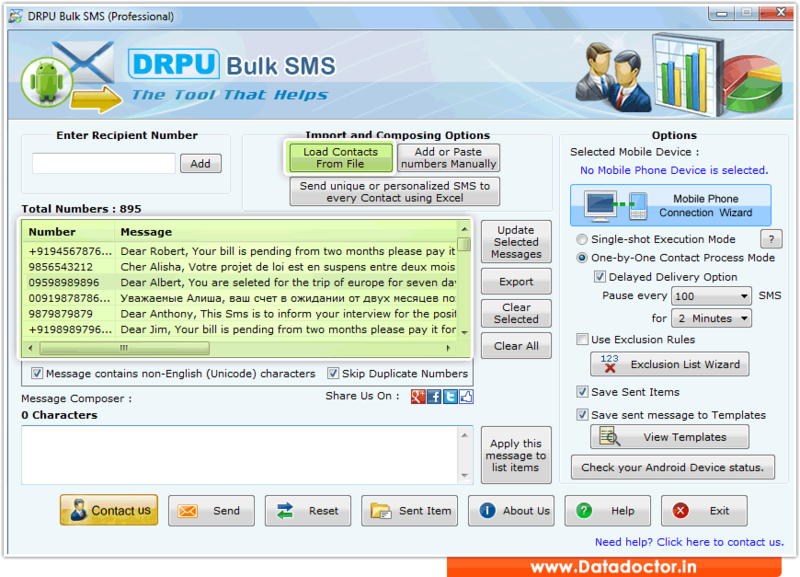 Bulk Text Messaging Software Professional sends instant multiple text messages from your Desktop PC/Laptop to individuals or list of recipient phone numbers via using Pocket PC smart phones or GSM technology based cell phones. Software sends mass sms and helps in providing marketing tool to increase your profits and business services, develop strong customer relationship. Bulk SMS software is useful to send group and customized sms related to job alerts and notifications, personalized sms, news alerts, promotional campaigns, invitations, contacting employees, marketing sms, greetings at national and international service network without any internet connection. » Send SMS to individuals or list of phone numbers. » Provides option to send SMS using Single Shot Execution Mode or One by One Contact Process Mode. » Save sent items record for future reference. » No use of internet connection to execute the software. Note: Bulk Text Messaging Software Professional can be easily installed on all major Windows OS including Windows 10/7/Vista/XP/Server 2008/Server 2003 and similar higher versions.